This pattern is quite the dream come true for me. Ever since I learned how to crochet I have wanted to make my children their own Catbus. I wanted it to be able to carry passengers but could never figure out how. One night it came to me how to design it without having to stuff the insides and to keep it from collapsing. I am thrilled to bring you this free pattern which also has a step by step video tutorial to go with it! Taking whole or parts of this pattern and/or photos away from Amigurumi To Go for any purpose is theft. Using one photo with a link back to the pattern is permitted. special notes: Make sure to knot off all your color changes and also make sure to piece the bus together in the same sequence as I do in the pattern. Any questions or if you come across a mistake in the pattern please leave a message below. 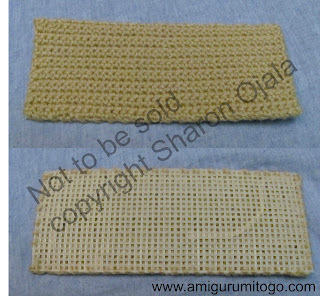 Lay your smaller yarn rectangular piece (Belly Piece) over the plastic canvas and cut a piece the same size. I counted the squares on mine and it was 50 squares long and 20 squares wide. 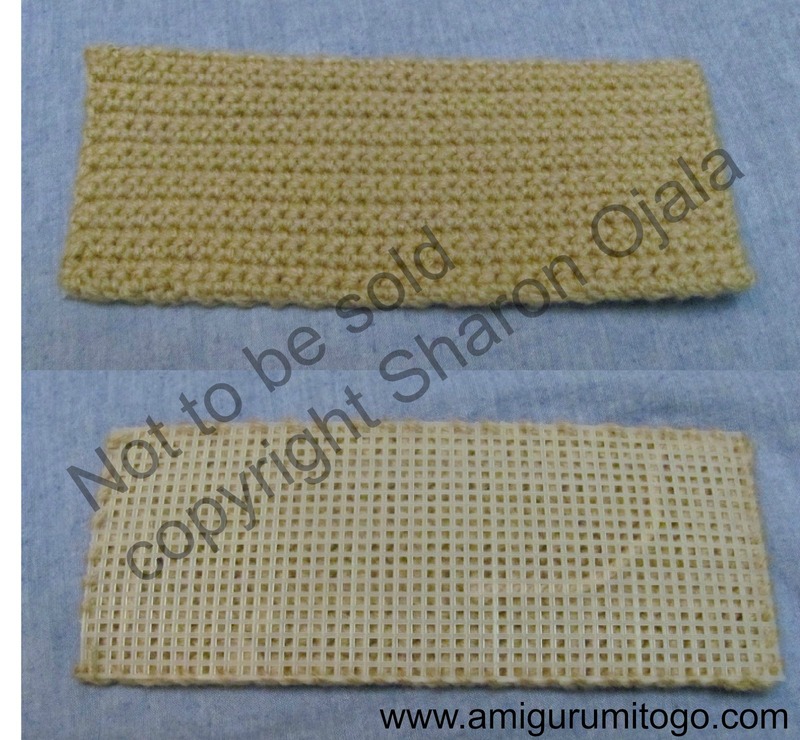 Your piece might be slightly longer or wider depending on how loosely you crochet a stitch. Make sure when you cut the plastic you have solid edges. Cut the larger piece the same width (20 squares wide) but no need to cut any length, you will be using the entire length of the plastic mesh. Lay the 2 pieces together, plastic sides against each other, and whip stitch the 2 ends together as pictured. Now sew the edges of the other end together. You can hold them flat together just as pictured above and they will still stand up when you are done! The rest of the Bus body will be built up piece by piece and in the order that is given in the pattern so it is important to put the pieces together in order. I got a little a head of myself and added the side tube before putting in the front panel and window frame on the front of the bus so in the picture you see the side tube that should not be there yet! 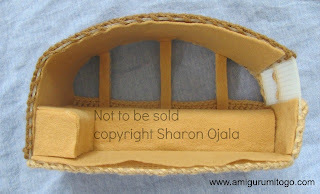 Please add the panel before continuing on to the next part of the pattern. f/o leave a long tail for sewing and sew it as pictured below. Sew it on each end and also sew it to the mesh. 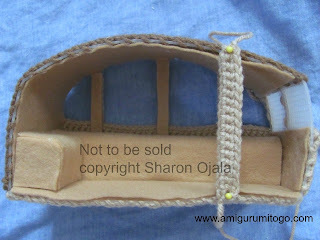 ** Sew this part on after you have cut out the windows so you can whip stitch along the sides and you don't see any plastic parts when done. Cut out the windows after you have the front side of the bus done, the side with the door. Make sure to leave enough width for the window frame! 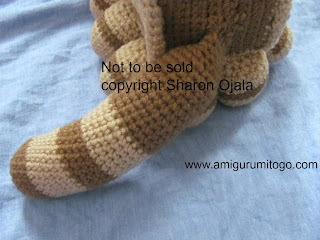 f/o and leave a long tail for sewing. Pin the tube around the edge of the bus as pictured above, stretching out the tube as you go. 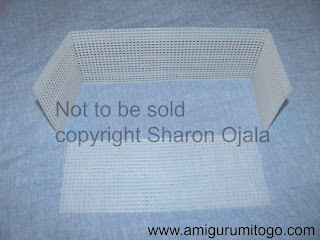 Sew the bottom quarter of the tube to the edge of the plastic mesh. You can not see the mesh but will feel it. Use what you would like to make the seats with. I used Styrofoam because it was super easy to cut to size. I cut two pieces, one long one that fits the length of the bus and one short one to fit along the back end of the bus. The seat looks like a L shape when put together. If you decide to hot glue your felt over the Styrofoam, use only a very light bead as hot glue will melt Styrofoam and your finished piece will look all bumpy. 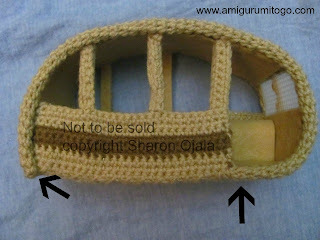 14) 2tog 4 times, note we will not crochet to the end on the row. 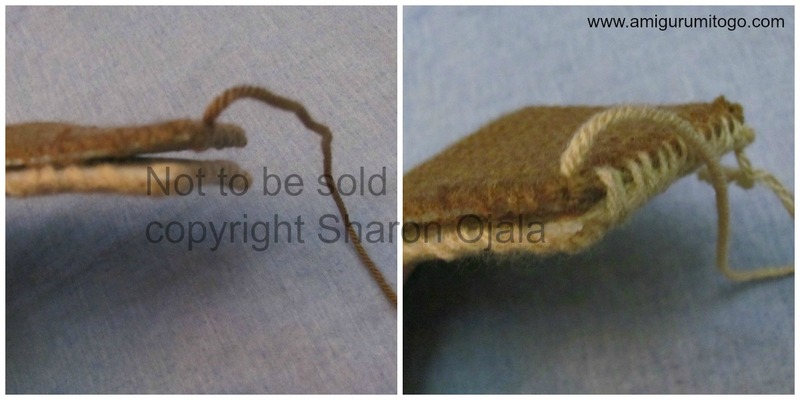 * turn piece inside out and knot off color changes. Be sure to knot off the pairs. See just under the color section of the head, this is the spot that will add a bit more shape to the head. Go under the head as pictured and come right thru and up where the needle is pictured in step 2, go back down thru the head and out just beside where you first went in. Now pull those 2 tails until you have the desired look. Knot off those 2 tails to hold that shape then hide the yarn tails inside the head. The nose is just a couple of whip stitches. Hide yarn tails inside head. 7) 2tog once then finish off, leave a long tail and carry that tail thru the nose right out the back and this will be the tail, cut to desired length. Rub some clear drying glue one the end of the tail to keep it from fraying. 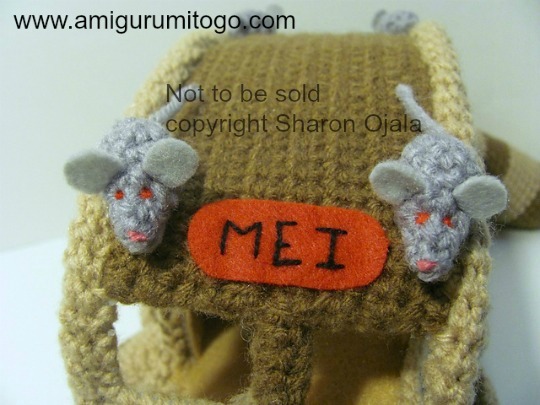 With red thread stitch in the eyes. And that's it! 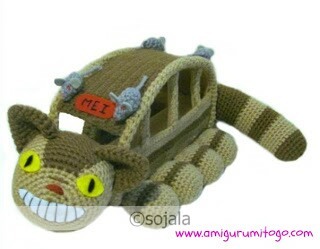 If you made a Cat Bus please post pictures on my facebook page Amigurumi Freely, I would love to see!